Craig Brown's Orlando-based sales job requires him to be on the phone while he's on the road. For that, he needs an in-car communication system like Ford Motor Co.'s Sync or General Motors Co.'s OnStar. Both allow hands-free calling. Over the past couple of years, Brown, 38, has owned vehicles with each system. Now he won't have it any other way. "My next vehicle will definitely have one of those two technologies on it," Brown said. Ford and GM agree that the systems are gaining importance in purchase decisions. The question for the two rivals is which system Brown -- and millions of other car buyers -- will choose. The longtime rivals are squared off in a race to bring telematics to mainstream car buyers. They say Sync and OnStar are key purchase considerations -- so much so that the technology changes how dealers sell vehicles and interact with customers. Ford and GM are reluctant to admit that heated competition exists, saying the systems are different and distinctive. OnStar has been known for safety features such as emergency assistance and stolen-vehicle recovery. Sync typically has focused on Bluetooth mobile phone connectivity and also provides information and entertainment services such as horoscopes and stock quotes. Craig Brown has had vehicles with both Ford's Sync and GM's OnStar, and says his next vehicle "definitely" will have one of them. Kim Ellis, of Jarrett-Scott Ford in Plant City, Fla., tries to swing him toward Sync. But each automaker is matching the other's key offerings. For example, Ford has introduced 911 Assist and Vehicle Health Reports to compete with OnStar. And OnStar is adding features such as voice-based text messaging from the driver's cell phone. GM admits that OnStar lost momentum during the automaker's restructuring and bankruptcy in 2008 through 2009. In 2008, GM seriously considered selling OnStar. As a result of the restructuring, development of some information-entertainment features got derailed, said OnStar President Chris Preuss. 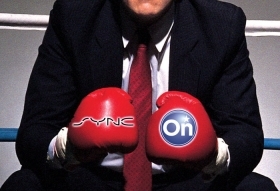 That gave Ford a good opportunity to promote Sync, putting OnStar at a disadvantage. "Who has most effectively marketed all this to customers' benefits? Hands down, Ford," Preuss said. "And they get the credit for it. But we are not following. We're simply on a slightly different strategy." Preuss is adamant about OnStar's central mission: peace of mind. "OnStar was built from Day One, 15 years ago, to be a dedicated emergency security services prompt device in the car," Preuss said. "Because we have that, we can do other services. We've been doing turn-by-turn navigation for six years now. We were reading e-mails to people before it was even cool to have e-mail." OnStar, which has about 6 million subscribers in North America, uses an embedded cellular phone in the vehicle. Preuss said the service is highly profitable for GM, although the company does not release financial data for OnStar. Ford's Sync is an infotainment system, based on Microsoft software, that pairs with a driver's Bluetooth phone. Sync initially was designed to control music devices and cell phones. OnStar's main competitive point with Sync is that its embedded technology makes it more reliable in an accident, said Doug Newcomb, senior technology editor of Edmunds.com. Whereas with Sync, the system is "only as good as your cell phone," Newcomb said. Ford CEO Alan Mulally recently told Automotive News that the automaker does not want to embed its technology in the vehicle. Ford thinks its approach gives it more flexibility to add features and services as technology changes. "Our approach is to absolutely be one with all the consumer electronics development around the world and not be embedding in anything in the car," Mulally said. "We want to manage the experience in the car." Ford says Sync's services are intended to improve safety because Sync allows for voice prompts for all services, phone calls and emergency help. It thus limits driver distraction. "The functionality on this is entertainment-based," said Paul Russell, Sync marketing manager. "But the key is being able to deliver it to the customer in a safe way. That's holistically how we look at it. It's communication and entertainment." But Ford did add 911 Assist to Sync for the 2009 model year to compete with OnStar's emergency response service. And OnStar knows it has some work to do to offer all that Sync does in entertainment. "We know we've got to be there. GM's infotainment strategy is totally addressing that," Preuss said. "Next year and the years to come, we're going to have more and more Sync-like features." Said Edmunds.com's Newcomb: "What you're seeing now is OnStar is trying to play catch-up. They've announced some new features they'd like to implement, such as receive text messages via voice and respond via speech." OnStar also is working on an application that lets users update their Facebook status using speech. An application is a software program designed to do a specific task. For example, GM recently came out with OnStar apps to provide remote starting and roadside assistance. The competing systems are sold differently, too. OnStar is sold through a subscription costing $199 a year. The price for the hardware is rolled into the sticker price. GM does not break out that information. Sync costs $395 but carries no other initial fees. After three years, customers retain music and mobile phone service but must pay a $60 annual fee to continue Sync services such as turn-by-turn directions, traffic and personalized information such as sports scores, movie listings, horoscopes and stock quotes. GM almost sold OnStar when the company filed for federal bankruptcy protection in 2009. But GM moved so quickly through bankruptcy that the sale never happened. And OnStar has benefited by having two GM CEOs with telecommunications savvy. When Ed Whitacre, former CEO of AT&T, took the top post in December 2009, he decided to keep OnStar but ordered that it be streamlined, Preuss said. OnStar has been doing that and is now starting a new marketing campaign. Similarly, current CEO Dan Akerson, who was CEO of Nextel Communications, saw value in OnStar. Said Preuss: "One thing Dan Akerson has made abundantly clear to me is that, look, OnStar is an incredibly powerful telematic tool. Secondly, you guys really have a communications challenge." In September, OnStar launched a new tag line: "Live On." The idea: Show the simplicity of using only a button to get such services as navigation, hands-free calling and emergency help. OnStar wants the dealers to step it up, too, by talking about the telematics service when selling a vehicle. It also wants dealers to use OnStar's vehicle diagnostics and e-mails to customers to get customers back for service and future sales. Preuss admits that only about half of GM customers buy the subscription service when their trial period ends. But he insists that's still good, considering OnStar has 6 million subscribers at $200 to $300 a year. Ford says consumers are three times more likely to consider a Ford product once they learn about Sync. "It's bigger than a deal closer," said Jim Farley, Ford's top sales executive. "Our Sync vehicles turn faster. In the current Focus, it's a reason to buy a Ford. It's a big deal. I've never seen a $300 to $400 option have that kind of impact on consideration." Ford provides dealership salespeople with the Sync services on their mobile phones so they can demonstrate functions to customers. Dealers say Sync's 911 assist feature typically impresses customers. But Sync has made selling cars more complicated for some dealers. 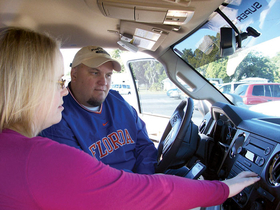 "There is more and more information the salesperson needs to know," said Jim Scott, co-owner of Jarrett-Scott Ford in Plant City, Fla. "You have to add a couple of steps, too, because before the person leaves, you have to get their e-mail address to activate syncmyride.com to get vehicle health reports. "So the process has changed. It's a lot different from showing them how to use the AC and the radio." Scott is even considering changing his pay structure to attract salespeople with strong technology backgrounds. "These cars are so computer-based now, it's like selling computers," he said. Other automakers and their telematic and infotainment systems include Mercedes-Benz's Embrace, BMW's Assist, Lexus' Enform and Toyota's G-Book Alpha service. Kia will have UVO, its Sync-styled system, in January. Hyundai is expected to offer a telematics or infotainment system in the next year or so. Fiat will offer its Sync-based system, Blue & Me, on the 500 subcompact here. Volkswagen is at least 24 months away from offering something similar, an industry source said. GM's new marketing approach, combined with its established technology, is promising, said Paul Haelterman, global managing director of automotive consulting at IHS Automotive in Detroit. "Look at how GM has been marketing its apps. This is positive, and GM is showing leadership in this space," Haelterman said. "They can steal Toyota's mojo and get people into [the Chevrolet] Cruze. The technology can do that." Haelterman said Ford's Sync is strong, too. It has proved technology can sell small cars to young buyers. "Ford just did a mild refresh on the current Focus a few years ago, but they put Sync on it and it was a game-changer," Haelterman said. "It clearly attracted Gen X and Gen Y'ers." Put simply, he said, "OnStar and Sync are the benchmark for everybody else in that space."